antifreeze from parking lots, potential contaminants from abandoned grain elevators, pesticides and fertilizers from residential and commercial lawns, pet waste, and other material such as trash into the channel through more than 70 storm drains. In 2012 the Pollution Prevention Institute at Kansas State University was awarded a $60,000 urban waters small grant from EPA, part of which was used to conduct water quality monitoring in the river channel in addition to engaging the public in the removal of invasive species along the river bank. Intended outcomes of their project include establishing an understanding of the pollutants present in the river and helping create a more informed public which understands the importance and process of maintaining the integrity of the river channel. Prior to receiving these funds, KSU had established a relationship with Friends of the River Foundation, a community organization. The mission of this group is to restore the natural channel of the Smoky Hill River to its role as an integral part of the aesthetic, recreational and economic life of Salina. In light of the funds received by KSU, it made sense for KSU to partner with Friends of the River, as well as the City of Salina, to achieve the goals of the community. and phosphorus. One round of testing was completed in fall 2014, the second round will be completed in spring 2015. The data will be summarized and presented to the City of Salina’s stormwater management department with the hope that, when used with the city’s outfall systems map, they can begin to identify the sources of pollutants. 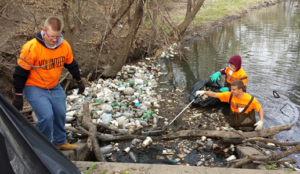 KSU and Friends of the River have partnered with the City of Salina at spring and fall community clean up events. At these events volunteers are trained by the city’s stormwater department on issues of water quality. Then they set out on foot to mark storm drains and place door hangars in neighborhoods to educate residents on how storm drains are connected to the Old Channel and steps they can take to reduce pollution in waterways. Additionally KSU brought in their State Extension Forester to host training for community members on invasive species removal along the banks of the Old Smoky Hill River Channel. The on-going efforts centered on the Old Smoky Hill River Channel have helped KSU, the City of Salina, and Salina community members better understand the current condition of water quality in the river channel and the condition of the banks of the river channel. Community members have been trained how to identify and remove invasive species without compromising the banks of the river channel and there is more attention being paid, community wide, to the health of the river channel. A demonstration site is being developed to showcase what the channel could look like when invasive species and trash are removed and replaced with ground cover and shrubs to stabilize the banks. A partnership with the local Master Gardeners and a grant from the Greater Salina Community Foundation is supplementing the EPA Urban Water Small Grant. Kansas State University (KSU) The KSU Pollution Prevention Institute provides free, confidential, and technical environmental assistance. PPI’s vision is for a healthy Kansas environment that fosters economic and environmental sustainability and growth. PPI’s mission is to promote sustainability through environmental education and services to industry and institutions. These services include environmental compliance and pollution prevention technical assistance.